TOMODACHI has now received the new NXEdgeStyle series of posable figures at both our Rosedale and Mall of America locations! These figures, which represent popular mobile suits from Gundam SEED Destiny and Gundam Wing: Endless Waltz, are fully posable and articulate, and come with several accessories and details that make this new line a must-have for fans of the franchise! The figures, which stand at 3″ high, each come with unique weapons and molding, including transparent pieces and alternate hands for a huge number of potential poses and play styles. 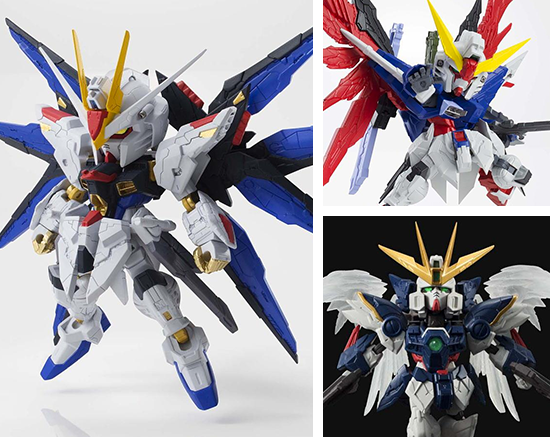 Featuring the Strike Freedom Gundam and the Destiny Gundam from SEED Destiny, as well as the Wing Gundam Zero Custom from Endless Waltz, these Gundam mini-figures are the first in a new series of upcoming SD-style Gundam toys, with more popular Gundams to come in the future! Check out either of our store locations to see these cool toys, and much more, for yourself!